A top pro-Narendra Modi scribe has revealed it all. 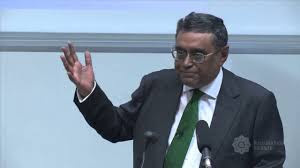 In a recent blog, he has said, there was no expert economic advise which drove Modi to demonetize Rs 500 and 1000 notes on November 8; in fact, he suggests, virtually giving credence to former finance minister P Chidambaram, that Modi did not consult any economist. Known for his open and long-time support to the BJP, especially Modi, Dasgupta was nominated as member of Parliament by the President in April 2016. Earlier, in 2015, the Modi government conferred on his India's topmost award, Padma Bhushan for his “contribution” to literature and education. It is Modi's politics, suggests Dasgupta, which behind Modi's move. “Regardless of what conclusions the collective body of Indians have arrived at — or will arrive at in the near future — Modi has made his credentials as an agent of change known to every Indian, and made them experience it”, he says, predicting, it would be a precursor to the the 2019 general election. Praising Modi for forcing a “revolutionary change on a civilization that has got too used to baby steps”, he says, it would help the economy go cashless, something already visible with the “demand” for card swipe machines going up drastically “among smaller shop owners and businesses”, pushing behind the era of traditional, cash economic transactions.